I was so excited to find a book that I’ve had for a very long time. It’s Diane Ackerman’s A Natural History of the Senses. She wrote it in 1991 and it was a New York Times Best Seller. It’s a great beach read if you are stocking up for the summer and to me just reading it is delicious. She has a way with words that always inspires me. The other book I uncovered, actually half a book, was The Magic School Bus Explores the Senses. I read this one so many times with my children that the first half of the book was missing. I ordered a new copy and fell in love with Ms. Frizzle all over again. Between Ms. Ackerman and Ms. Frizzle, the senses come alive. For humans, our ability to see and the fact that we have predator eyes (both located at the front of our heads) mean that our vision is the main way we appraise and understand the world. Ackerman shares that seventy percent of the body’s sense receptors cluster in the eyes. As predators, our binocular vision gives us the ability to sight, focus and track our prey. I’d never thought of my ability to see as my primary tool as a predator. When you study the senses you begin to see every aspect of our human design has a purpose. Our eyes give us many abilities beyond tracking prey. We think of our eyes as the proof of what is real, wise seers, yet all the eyes do is gather light, bounce it around and the details of how vision works are beyond this exploration. Even as Ackerman describes the color of eyes, she reveals that blue eyes are not blue as in stained blue like dyed fabric, but blue because there is less pigment than in brown eyes. Things may look a certain way but they are not always as they appear. What I love about my ability to see is that not only is it critical to keeping me safe and makes day-to-day living much easier, I also can see and appreciate the beauty of life. Last week I suggested putting a picture of a favorite place at your desk. Seeing that place is critical to being able to appreciate it. This week I have two invitations. What is your favorite color? Or your favorite color of the day? Seeing and loving colors is one easy way to find joy in life. Colors also are about the textures and shapes they inhabit. I love the bright yellow of the recent daffodils and how they darken to a pumpkin yellow as the blossoms dry up. The dainty white shape of the Lily of the Valley flowers is the essence of innocence to me. 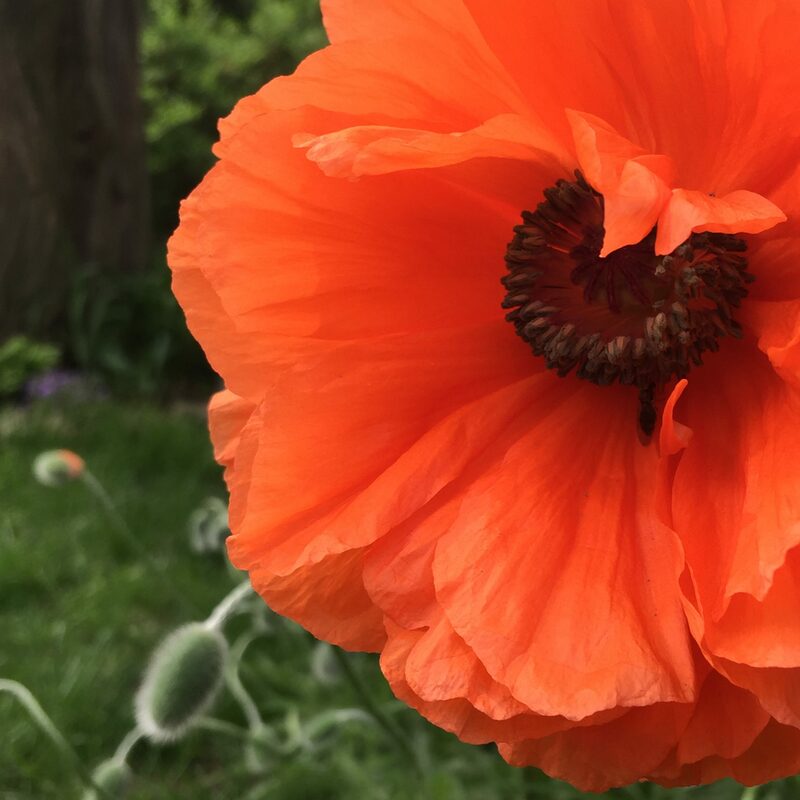 The crepe paper poppy petals that have just emerged out of the fuzzy green pods are like a rich dessert of orange ripples. Over the last few years I’ve found that getting lost in the colors of nature has an unexpected calming on my body and mind. Just taking a moment to stop and feast on the colors and textures of nature soothes my soul. What can you see that is a feast for your eyes this week? What colors and textures gently rock your heart? My second invitation this week is to close your eyes. To be awake and to close your eyes, to inhibit your ability to see and explore how the others senses rise to fill the gap. When you practice mountain pose or Warrior II this week close your eyes. Find your balance with your body and see which other senses engage. See what is inside and imagine the landscape that is inside you. Let your imagination go wild. What colors and textures will you bring inside so life feels good? You, my dear, are an artist. What you imagine is the first step to making those rich, vibrant, delicious colors and textures beautiful and real in your life, inside and out.